Seren, Doc and Adam in this episode review the current Inhumans titles – Death of the Inhumans #4 & #5, Ms Marvel #35 and Moon Girl and Devil Dinosaur #36. Results of the giveaway announced too! Episode 47! Doc returns this episode to review the biggest, baddest comic of recent times. Death of Inhumans #1 where we discuss exactly what we think happened, and why Gorgon is back? Because you cannot have the darkness without the light, we also go back and review Ms Marvel #31 aka the bumper 50th issue of our favourite Jersey Superhero. Ease up! Yes we are reviewing an X-Book! 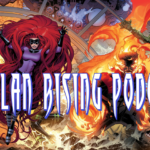 In this episode Seren, Doc and ADam review all the usual suspects; Marvel Rising Alpha, Moon Girl and Devil Dino #31, Ms Marvel #30, Lockjaw #4 and Dazzler: X-Song. Dazzler X-Song was such a nice book and I urge everyone to go buy it! In this episode Seren, Doc and Adam have a brief chat about Infinity War, as well as the usual reviews Moon Girl and Devil Dinosaur #30, Marvel Rising #0, Lockjaw #3 and another quick chat about Exiles 2 and 3 by Saladin Ahmed.